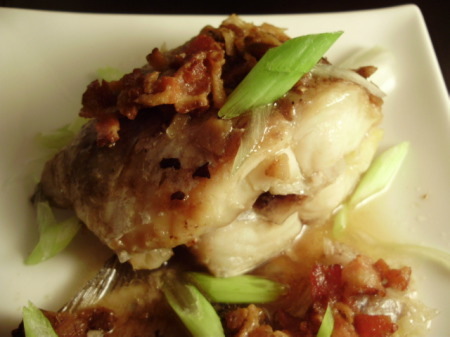 Cooking fish with an asian flair is a delicious way to add some variety to your menu. 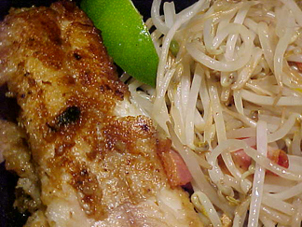 Here, a salty/sweet soybean (miso) paste adds depth to firm fleshed catfish. 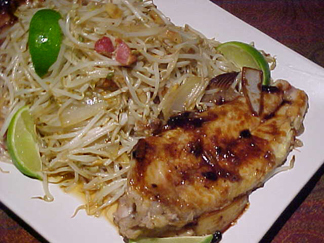 The dish is balanced by crispy, fresh bean sprouts, tossed with tasty ginger, garlic, onions and bacon. Season fish with salt, peppers, and garlic powder. 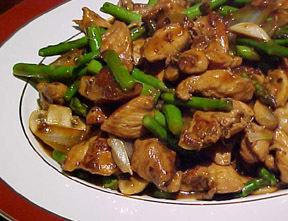 In a small bowl, combine soy bean paste, oyster and soy sauce sauces. In a large skillet, heat about 1 tbl olive oil over medium heat. Add fish and cook for about one minute, slightly browning side that is down in the skillet. Turn fish over and begin browning the other side. Carefully add one clove garlic and reserved soy paste mixture to skillet. Stir sauce and coat fish. Continue cooking until fish is just done – about one minute for filets, or cover and cook whole fish about two minutes more. Do not overcook. 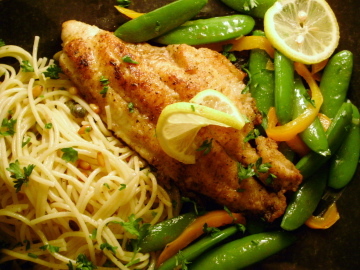 Remove fish to a dish and keep warm. Heat about 2 tbl olive oil over medium high heat in a large wok. Add bacon and cook until beginning to crisp. 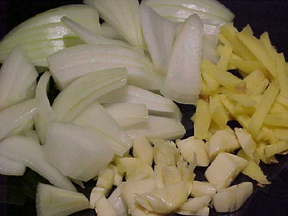 Add ginger, garlic, and onions. Sprinkle with about 1/2 tsp salt, 1/4 tsp white pepper, and pinch of brown sugar. 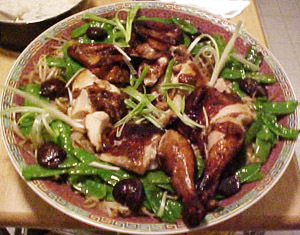 Cook for about 30 seconds, until onion and garlic become fragrant. Add bean sprouts all at once, and stir fry for about one minute. Do not overcook; the bean sprouts should still be crisp. Season with 1 tsp soy sauce and 1 tsp oyster sauce. 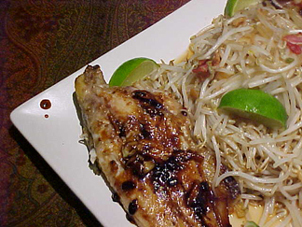 Remove bean sprouts to large serving platter, arrange fish on top, and drizzle with pan juices and sesame oil. Garnish with lime or lemon slices and serve immediately.